The EU is inherently a transnational neoliberal project. It is unrealistic to expect, and disingenuous to suggest, that it can be transformed into anything else. 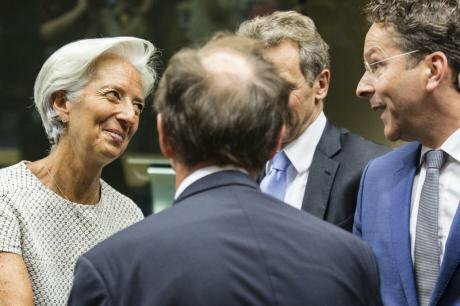 Eurogroup meets in Brussels for final Greek proposals. Demotix/Sander de Wilde. All rights reserved. Anyone (still) following the “Greek crisis” in the social and traditional media will have noticed the growing expressions of Euroscepticism. What once was a minor nuisance in the European Union (EU), relegated to mostly ostracized extreme and radical parties, is rapidly becoming the predominant sentiment across Europe, whatever the position on the EU-Greece negotiations. The term “Euroscepticism” has always been a container concept, initially denoting anyone who had some critique on “The European Project,” however small or detailed. This was not very problematic until the late 1980s, as European integration was still an elite-driven process profiting from a “permissive consensus” of the vast majority of the European peoples. The Maastricht Treaty of 1992 changed this, slowly but steadily. It did not only introduce the European Union and the (now increasingly cursed) Euro, but also birthed mass Euroscepticism. Sure, it took some time, but by the late 1990s Euroscepticism was so diverse and widespread, at both the elite and mass levels, that scholars like Aleks Szczerbiak and Paul Taggart started to distinguish between “soft” and “hard” Euroscepticism, in which the former referred to detailed critique and the latter to more fundamental criticism. Petr Kopecký and I elaborated upon this important innovation by going to the core of the process of European integration and distinguishing between general and specific critique/support of European integration. By diffuse critique we meant criticism of the general ideas of European integration that underlie the EU, i.e. pooled sovereignty and an integrated market. By specific critique we denoted criticism of the general practice of European integration; i.e. the EU as it is and as it is developing. We reserved Euroscepticism, in line with the more general meaning of the term “skepticism”, for views that are supportive of the ideas of European integration, but critique its general practice (i.e. the EU). We termed critique of both the general practice and the general ideas Eurorejects, as they reject the fundamentals of the process of European integration. The rise of Euroscepticism is not so much a consequence of changed values or priorities of the European masses, but rather of the changed nature of the process of European integration and the increasing awareness of this by the European elites and masses. Today’s European Union is a very different beast from the European (Economic) Community of the 1980s. Moreover, the Great Recession has finally hit home what “integration” and “solidarity” really mean, and many Europeans don’t like it. Still, both at the elite and mass level most responses are as halfhearted and misdirected as the EU solutions to the Greek crisis and Great Recession. Consequently, although there is a minor increase in Eurorejection too (see recent changes in Front National and Party for Freedom), most elites and masses have responded with some vague form of Euroscepticism. The most extreme example of this conflicted response to the perceived fallacies of the EU is that of the current (?) Greek government, which literally made its career by selling an illusionary ‘Third Way’ in between the politics of the Memorandum (mainly supported by New Democracy and PASOK) and the Grexit (mainly supported by the Communist Party of Greece and Golden Dawn). By now the last illusions of this misguided policy should be clear to all, particularly those manipulated into voting “OXI” in the Greferendum, while experts are left to calculate the enormous economic and political costs that this half year of amateur-politics of Tsipras and Varoufakis has cost Greece. Just as the Greek parties and people continue to reject a Grexit, instead complaining about the “EU dictatorship” and “German blackmail”, the vast majority of non-centrist parties of left and right keep hiding behind a socially more acceptable, but politically disingenuous, Euroscepticism. From most members of the right-wing Eurosceptic European Conservatives and Reformists (ECR) group to the majority in the left-wing Eurosceptic European United Left - Nordic Green Left (GUE-NGL) group the official mantra remains that “A Different Europe is Possible” within the EU. It is not! The core principles of the process of European integration, of which the EU is the current representation, are and will always be: pooled sovereignty and an integrated market. In other words, the EU is inherently a transnational neoliberal project! Sovereignists of the right (and left) as well as (real) social democrats and socialists on the left should therefore be fundamentally opposed to the EU. It is unrealistic to expect, and disingenuous to suggest, that the EU can be transformed into anything else (leaving aside a couple of ‘green’, ‘national’, and ‘social’ tweaks here and there). Anything else is by definition not the EU. There is therefore no reason to “reform” the EU into a “European of Nations” or a “Europe of International Solidarity”. In fact, this can only be achieved outside of the EU! As politicians like Tsipras very well know, there currently is no majority support for an exit in any EU member state, not even in Greece or the United Kingdom. But rather than continuing to sell an illusion, politicians of the left and right should shed their deceiving Euroscepticism, which in the end only strengthens the idea that the EU is the (only) way forward, and start developing a true alternative to life in the EU. They should explain to their supporters why what they want to achieve, cannot be realized within the confines of the EU, and why an exit does not equate to a Third World War or Auschwitz. Obviously, this goes beyond simplistic studies such as the Nexit one of the Party for Freedom (PVV) in the Netherlands. Politicians will have to be honest about the probable short-term costs that will almost certainly have to be paid for the possible long-term gains. In short, they have to show that a different Europe is possible, but not within this EU or any future EU. Any party or political group that wants to build a really different “Europe” will have to do so outside of the EU. But in order to do so, they will have to denounce their official Euroscepticism and start convincing the population to do the same. Even if this will not convince a majority of Europeans, it will lead to a more honest and transparent debate on European integration. And this will benefit everyone, irrespective of their position on the EU.